I just finished a few more signs! If you see your order here, it will be shipped out tomorrow! 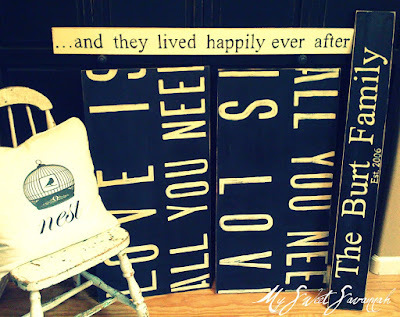 and in a few I will have 2 of these happily ever after signs available on etsy! Very cute Melaine! Make sure you stop by for the last day of my drawing! I am so happy you're doing the "All you need is love. Love is all you need." I'll have to check your prices. I saw a british site that was outrageously expensive. How sweetly appropriate! Love it!! Love the signs! They are all so cute!! I love the signs, but I especially love the pillow. You do great work!